If you are like me, personally being a Harry Potter fan isn’t enough. We must force this love onto everyone around us! And, as a mother of 3, I have tiny humans to make adore all things Potter. 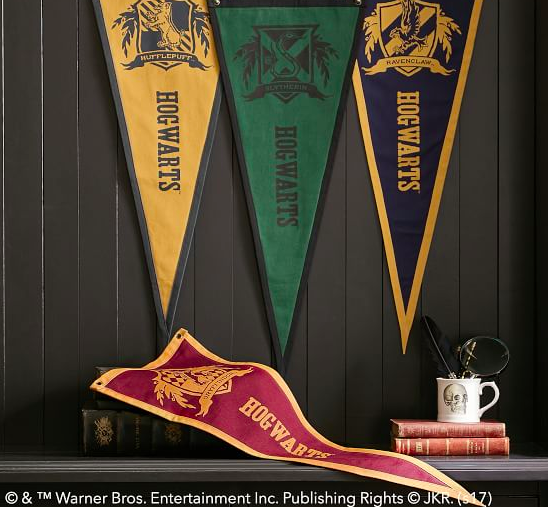 Lucky for us, Harry Potter merchandise is no longer hard to find. Most mainstream stores today sell HP gear. 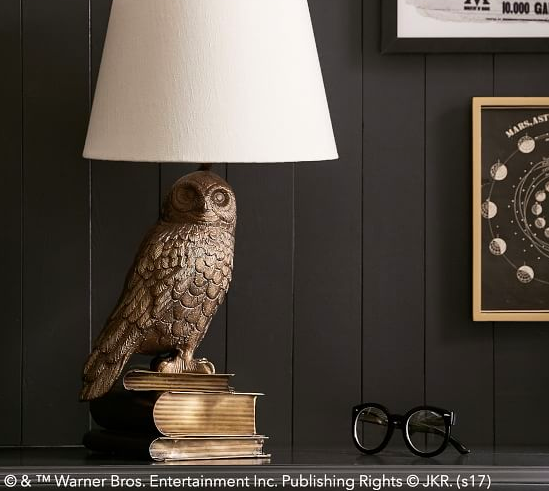 You may have seen Harry Potter home decor at Target, Walmart, or even Amazon. 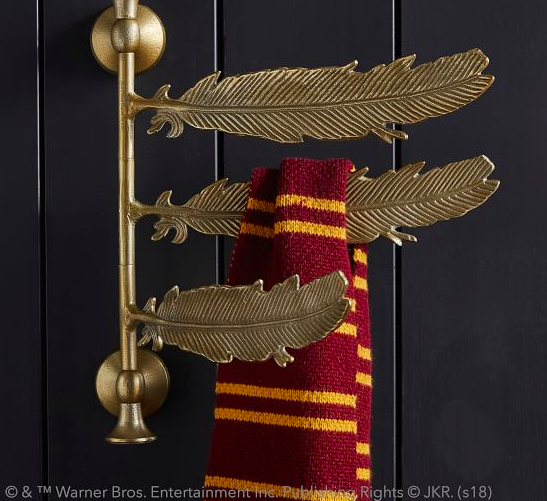 However, the BEST decor (I have seen) to turn a Muggle into a Wizard comes from Pottery Barn. 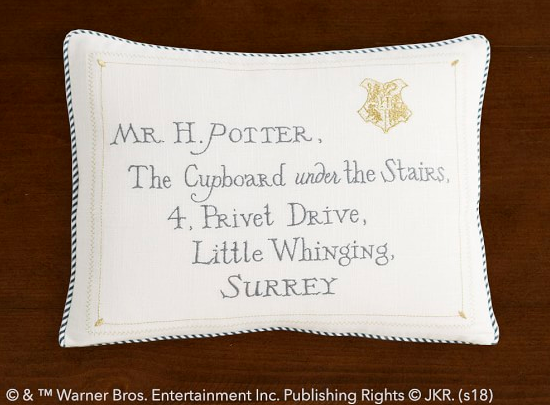 A few months ago, Pottery Barn released a Harry Potter PBTeen line of products that ranged from bed sheets to bean bag chairs to luggage. 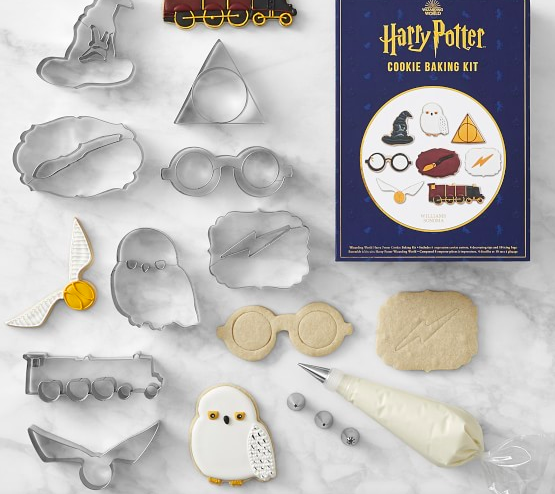 The line was so popular, Pottery Barn, Pottery Barn Kids, and Williams Sonoma also launched Harry Potter collections. Potterheads Rejoice! I personally LOVE each and every item in these collections, but since most people can’t afford ALL of them, I’ll just list my 9 favorites. 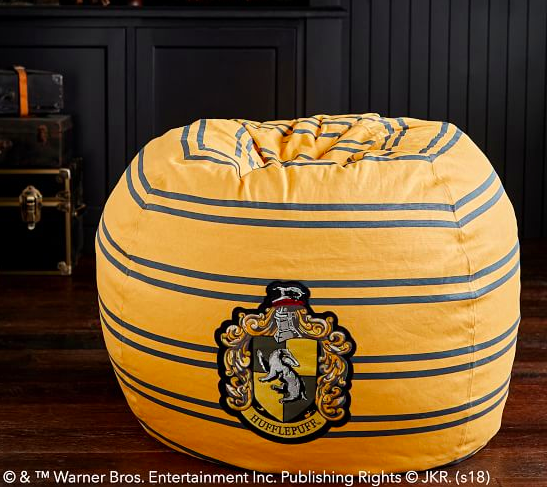 They have a few different style bean bag chairs, but I don’t think sitting on Hedwigs face is for me….so I’ll stick with the House bean bags. Easy to move around and MACHINE WASHABLE COVERS make this a no-brainer. Psh maybe I should be a Ravenclaw, I’m so clever. 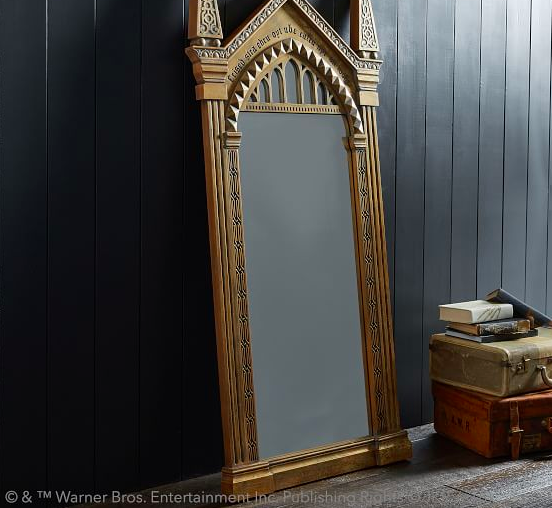 The only reason this isn’t #1 is because it costs FOUR HUNDRED DOLLARS but besides the price tag this mirror is perfection. It looks EXACTLY like the one in the movies and I’m positive it has magical properties. Don’t @ me. If you don’t happen to have $400 to spend on a gilded mirror, may I suggest these $19 pennants? They are so classic looking and could compliment any child’s room, even one that isn’t 100% decorated HP. I love lamp. I mean I love THIS lamp. It looks like something you would find in a 19th century library. And rooms need light so it really is a necessity if you ask me and you shouldn’t feel bad about treating yourself — I mean your kids — to this awesome desk lamp. Cookie cutters probably don’t scream “room decor” but we are talking kids rooms, so there are probably toys right? I would put these in a box with a bunch of playdough for my kids to play with. Imaginative play is very important for development, especially hand-motor skills like rolling and cutting. Mom and dad may want to make a hot butterbeer to go along with these sweet treats. Check out our favorite butterbeer recipes. This one may be the cutest item on the list. It looks exactly like the letter Harry Potter was sent to inform him of his entrance into Hogwart’s School of Witchcraft and Wizardry. I know all of us wish that letter had come to us when we turned 11, so why not spread a little magic to our kids? Each of the sheet sets is special, but this one is my favorite. 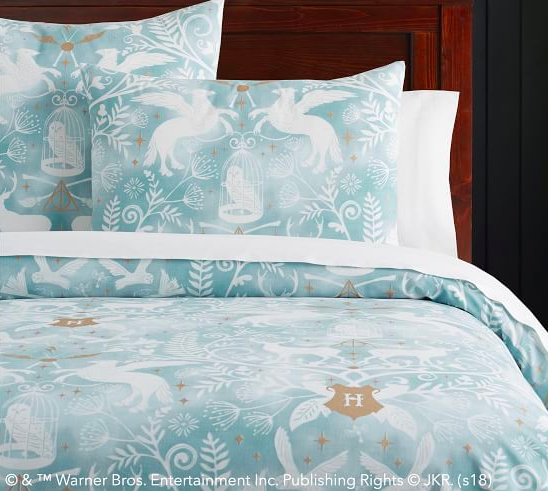 The Patronus is such an important element in the Harry Potter series, and this pattern is a very elegant rendering of that. It comes in Mint of Burgundy, whichever your little House Elf prefers. It is hard to pick a favorite out of the dozens of items available through Pottery Barn and Williams Sonoma. 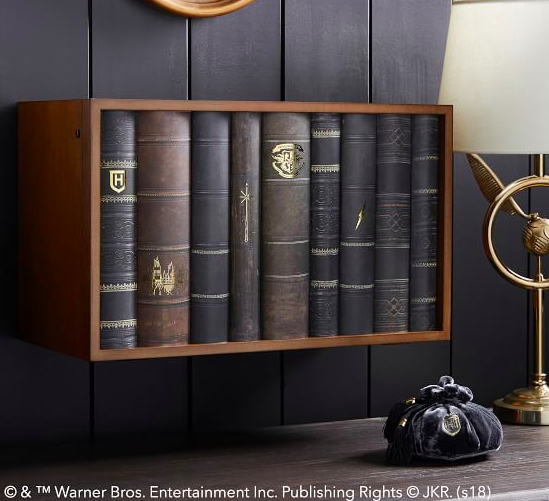 What I love about this item is that it doesn’t actually appear at all in the HP book or movies, it is more like something a witch or wizard would have. A place to protect their secrets and their galleons and their invisibility cloaks. And the brass key to open it is a nice touch. Which of these items are your favorite? Do you have kids with a love for HP? Written By Ashley Craft: Follow Ashley on her blog Crafted from the Kingdom.